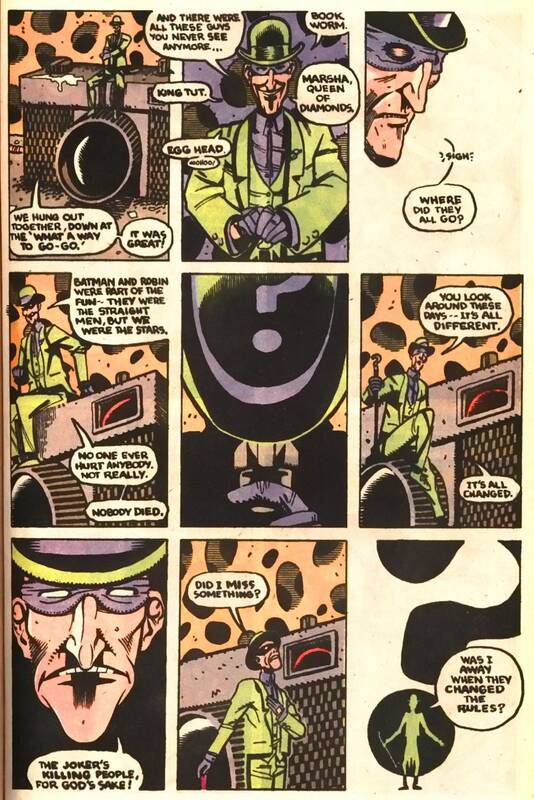 I love this sequence, and the Joker's last line there is perfect (for an old school Joker fan like myself at any rate). I assume it works for new school Joker fans as well. I guess the difference there is the assumption that what does Joker actually find funny. Don't it just bring out the Hamill Joker out of it all? in all the best ways! 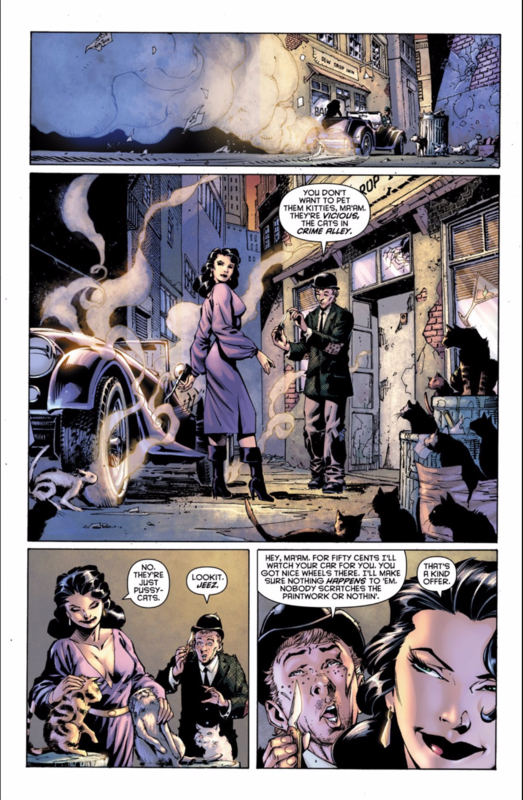 I really enjoyed this story (especially Alfred's, ah, unique revisionist history of Batman). The Joker there reminds me of the Riddller story in Secret Origins Special (also by Gaiman) where the Riddler bemoans, "Even the Joker's killing people." http://www.imgur.com/3k6WjNG.jpeg Didn't quite get the quote right, but I still like the sentiment. It's a light comic-relief scene within a more serious, overarching metafictional plot, true. Nonetheless, with just a few panels, Gaiman shows he understands the Joker much better than a number of Modern Age writers do. 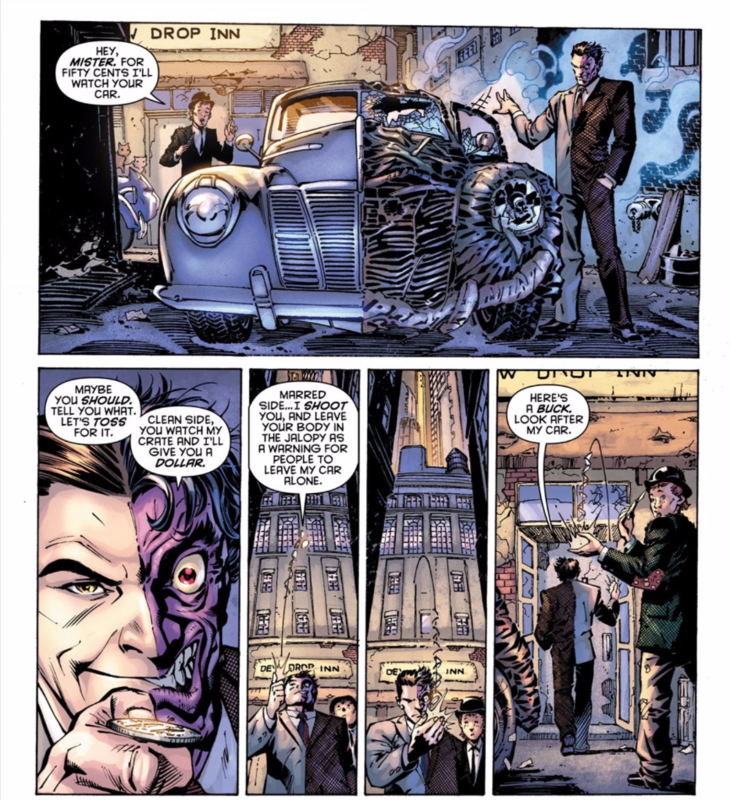 I admire Two-Face's commitment to his shtick. That car does NOT look road-safe. You know he only takes it to the Janus Brothers Auto Shoppe on February 2nd for inspection every year. Think he flips on which side he rides on? And if it's the passenger side, he gets someone else to drive him, rather than driving himself? I like the idea that Joker is probably pretty depressed and humorless in this scene. He's going to Batman's funeral, after all. And it dovetails well with the Joker's eulogy, in which he relates how he poisoned Batman with an enormous dose of Joker venom, only for Batman to die without laughing or even smiling, despite his archenemy pleading with him to smile. "It wasn't funny," says Joker sadly. "But it should have been." 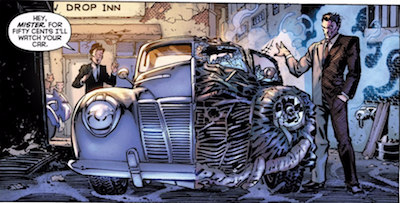 So is the driver's seat in Two-Face's car on the marred side (as it would be with most American automobiles)? Or did he have it customized so the seat can shift positions? Or does it sit smack dab in the middle? Did Harvey just give the valet his two-sided dollar? Honestly, this is didactic and lacks a punchline. This kid is dumb enough to run his protection racket on all the other Gotham supervillains, but is suddenly struck dumb when the Joker arrives. 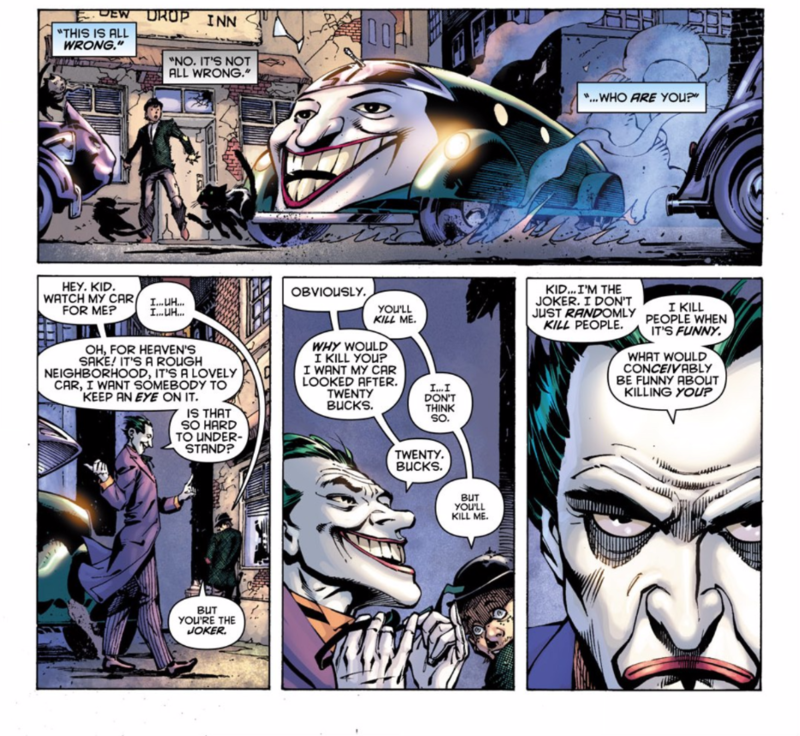 And not just any Joker - the Joker who drives a car with his face on the front of it. Why the sudden shift in mood? This kid is an idiot who keeps pushing his luck, him getting his just deserts would actually be funny. As is, that last scene is anti-humor. For some reason, I read this guy's lines in my head in a mixture of a brooklyn and stereotypical gangster accent.